They did a good job with my minor bodywork. I got a very good quote compared to 4 other shops, and it was guaranteed for the life of the vehicle. Jose was very professional and honest and was up front about how they would fix the dents. They also contract with car rental companies and Hertz provided a competitive rate. Jose let me leave the car so the rental company could pick it up the next day. It was convenient and they did a good job – I would refer them to my friends. I was referred by a a dealership to All Makes Auto body Shop. I did my research on yelp although he has 2 excellent ratings and 1 poor I decided to take my car in. The dealership said they send all their cars to them. Which made me very comfortable. Jose was professional and pinpoint all the necessary repairs that need to be done. He handled all the insurance processes to a T. and also made arrangements for a rental. I couldn’t have asked for more. My car was ready in time just like he promised, and to my surprise I couldn’t even pinpoint where the accident had happen, and not only that but my car was detailed inside and out. So for sure any other problem with our cars my family will be going to see Jose. Thanks great Job done. Jose is great. I have a classic car and he worked it in with his other jobs. It needed a lot of work, metal work, etc. It came out great and within the budget we talked about. Great job.. I was rear ended while driving my wife’s 95 Honda Civic. I have had All Makes Auto Body do repairs on my other vehicles. No question as where to take it for repair. Had the Honda back in a week. Paint matched perfectly . Also had it detailed in and out. Jose and his crew take great pride in their work. My wife was pleasantly shocked as to how good the car looked. 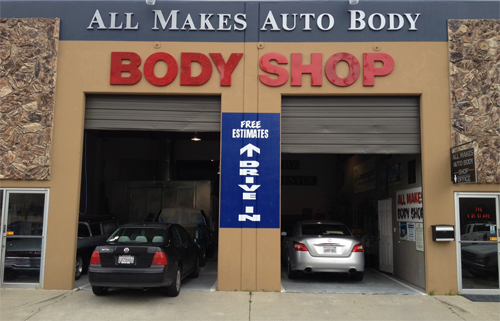 All Makes Auto Body Shop is family owned and have been in business since 1986. We repair all foreign and domestic makes and models to pre-accident condition approved by all insurance companies. 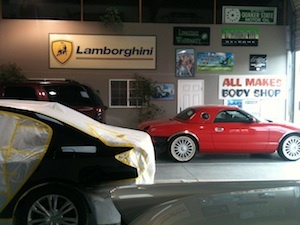 All Makes Auto Body Shop has highly trained on-site technicians and state-of-the-art 5500 square foot indoor facility. We also offer a number of services that make restoring your car easier such as towing, car rental, and secure on-site vehicle storage. Why All Makes Auto Body Shop? Free Estimate: We’ll meet you and learn about the history of your car. Our technicians will then prepare a detailed estimate of what they’ll do to restore your car to pre-accident condition. Structural Repair: We use the Chief Easy Liner to detect misalignments and restore the vehicle to its proper structural alignment. Paint and Finish: We only use the best quality PPG paints to ensure optimum gloss and durability. Colors are mixed by factory computer codes and then custom tinted by a trained technician to match your vehicle’s specific color. Expert Detailing: We offer a range of detailing services to make your car gleam like new. We offer discounted rates on repairs. Ask us for our complete menu of options. Written Warranty: We give each customer a detailed written warranty specific to the services performed on the car. We strive for total customer service and work hard to earn and keep your business.